Regular readers of this blog may know that we at Interesting Literature are rather fond of the following story about the genesis of To Kill a Mockingbird. The story goes that Harper Lee’s friends gave her a year’s wages for Christmas, on condition that she give up work and write. By any standard of measurement, she used the time off work wisely: she wrote To Kill a Mockingbird. It was published in 1960 and remains her only novel. Harper Lee – or Nelle Harper Lee, to give her her full name – is now 88 years old, but her one novel has done enough by itself to secure her reputation. It has sold over 30 million copies. This morning, it was reported that Michael Gove, the UK Education Secretary, has removed To Kill a Mockingbird and John Steinbeck’s Of Mice and Men from the school GCSE syllabus. Gove reportedly dislikes Steinbeck’s novel and wishes to replace the more modern literature currently studied in UK schools with pre-20th-century English writers, notably Dickens and Jane Austen. (As many on Twitter have wryly joked, Gove’s probable choice of Dickens novel would in all likelihood, ironically, be Hard Times, which is a satire on joyless and mechanistic education.) There is to be little non-English literature studied on the new syllabus. This means that Arthur Miller’s The Crucible is also unlikely to find itself studied in schools in the future if Gove’s plans continue unchecked. Here at Interesting Literature we love Dickens, but there is a reason why many young readers respond to novels like Of Mice and Men and To Kill a Mockingbird when they study these classics in school. For one, they’re relatively short and written in a plainer language that is easier to understand than much nineteenth-century fiction, which favours long words and longer sentences, as was the order of the day. There is space for Thomas Hardy and Jane Austen on a GCSE syllabus, but it’s about balance. For another, novels like Lee’s, Steinbeck’s, and others currently studied in schools, deal with important socio-political issues such as prejudice involving class, race, and gender, as well as ideas about belonging and justice – and one of the chief values of studying literature is that it introduces you to systems of belief that are very different from your own, as William Empson once put it. Without sounding too old-fashioned, it can act as a way of exploring complex moral issues. For yet another, these novels help to introduce young readers to a world of literature beyond their own shores – though of course, it’s important that they know about Macbeth and Great Expectations as well. A writer who so clearly saw the need for literature in the modern world deserves to have his own literature needed. She’s like a national treasure. She’s someone who has made a difference … with this book. The book is still as strong as it ever was, and so is the film. All the kids in the United States read this book and see the film in the seventh and eighth grades and write papers and essays. My husband used to get thousands and thousands of letters from teachers who would send them to him. It is a similar story in the UK, with many readers citing Lee’s novel as an important book in their formative years. But how many would have picked it up and read it, had they not studied it in school? You can sign a petition to urge Gove to reconsider his plans to change the current GCSE syllabus here. The word ‘gove’, by the way, is a verb meaning ‘to stare stupidly’. With this meaning it dates from the fifteenth century. However, that’s when it’s used as an intransitive verb. As a transitive verb, the dictionary offers a second definition: ‘To examine; to investigate’. One hopes Gove will reexamine and re-investigate his own decisions about the role of literature in education. 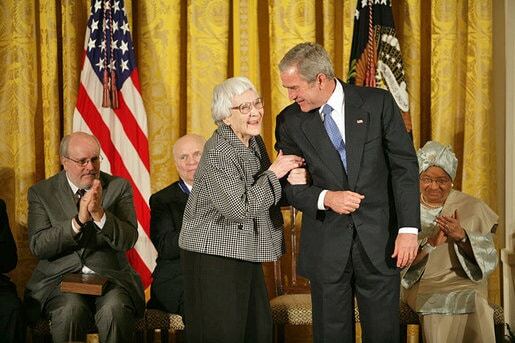 Image (top): Harper Lee in 2007 receiving Presidential Medal of Freedom from George W. Bush (White House photo by Eric Draper), public domain. Image (bottom): Michael Gove speaking at the Conservative Party “Big Society” policy launch (author: Paul Clarke), Creative Commons. Great post. I ate lunch with Ms. Lee a year or so ago after one of my students won a TKAM essay contest. She is a wonderful lady. I have a blog coming about the luncheon. I love Dickens now, but my first experience of him was as a teen reading Hard Times. It did nothing for me and I gave up half way. The humour seemed heavy-handed and Stephen’s angelicism I found unreal and a bit sickening. So I agree teens should be given more accessible stuff like Lee and Steinbeck, both of which also have less oppressively didactic authorial presences than Dickens. Great post. Much as I love Dickens, Hard Times is his weakest book in my opinion. And I love Jane Austen but most boy readers won’t. If we want students to love literature, give them Steinbeck and Lee by all means – those books are accessible, thoughtful, and still speak to our time. Great post about an important book. Literature is a very big tent . . . why not Dickens and Austen and more contemporary fare like To Kill a Mockingbird an Steinbeck??? Thanks. Excellent. Gove is…there are no words. To kill a mockingbird and of mice and men weren’t even part of our GCSE syllabus when I was at school. I have never read the books, but now I’m thinking I should. As much as I love 19th century fiction, to study it exclusively seems very narrow. Are we trying to tell children that there’s no point in becoming writers, or reading modern books because anything worth reading was done over a hundred years ago? . Of course not, it’s all about balance as you say. I’m in a bit of dilemma here – I love To Kill a Mockingbird as a books (and film) but don’t know how to compare it against Dickens or Austen logically. Shame we have to make these sort of decisions at all but I suspect GCSE can’t have too long a reading list. The books I read in school – Dickens, Shakespeare and some old-fashioned short stories – were the only works of literature in my entire teenage years that I didn’t get on with, hated in fact. I would have got a great deal more out of Harper Lee. I have no words really to express my feelings about Michael Gove and his policy decisions. Hard Times tells of a man who is so convinced of the rightness of his (wrong) views on education that he is prepared to sacrifice his own children’s future happiness to them. He comes to the appalling realisation of the damage he has done by accepting dogma a rather than common sense or received wisdom. Gove won’t come to this realisation, but he will be removed from office. He is not a big picture thinker. More of a blinkered myopic who sees things clearly and well because he doesn’t see very much at all. He will go though. All the self-righteous education secretaries who have used their time in office to tell career professionals what they have been doing wrong have come and gone like the tide and left little behind. Harper Lee and John Steinbeck will outlive Michael Gove in English schools by a few more generations yet. There’s lots to take a swing at Gove for, butI’m not sure this is it. Have you tried teaching Of Mice and Men to 15 year old British students? I have. It is very simply written which may or may not be a good thing, but it is also a specific text of the America in the Great Depression. None of the cultural background has any meaning for them and they don’t have any access to in History (which is Hitler and Stalin on a loop). So these American texts feed into their saturation-lvel diet of American culture. Fine, if that’s what we want, butI think we may be missing something. American cultural hegmony is rampant, and it seems quite pleasingly radical and – well, left-wing – of Gove to attempt to resist. I read Pride and Prejudice at school for my GCSE. It was as alien from my life as the story of Of Mice and Men. The cultural background of Pride and Prejudice had no meaning for me, any more than that of any other text. I’m not sure replacing social critiques like those of OMAM and TKAM with a few more dead, middle-class white English dudes is ‘radical’ – I seem to remember the same texts dominating when I started teaching in 1995. Pride and Prejudice depends on good quality film or television to aid the teaching of it; at least you can teach Of Mice and Men without the need for Keira Knightly. And that is something I have always been eternally thankful for. I read To Kill A Mocking Bird as part of the english literature syllabus at school together with Steinbeck’s The Pearl. I also read Middlemarch and Shakespeare, a good rounded education if ever there was one! I read To Kill A Mockingbird at A-Level but I think it would be just as suitable at GCSE. I loved the texts that I studied for GCSE (Great Expectations, Romeo and Juliet, and Of Mice and Men) It’s already bad enough that in most schools only the top set are given the opportunity to study Literature for GCSE but to assign such slow classics will only discourage students even more. Most kids only hate Shakespeare because they were given something like Macbeth first which is quite hard to understand when it’s your first foray into the language. As per usual Gove proves that he has no idea what he’s talking about. Thank-you for linking to the petition. I read about this in The Guardian today and was horrified. TKAMB is one of the main reasons I love reading/writing so much. It’s disgusting. Most of the books I read in school taught me that “literature” always has a political agenda. Instead of opening my mind to the music of a writer’s soul, I developed a callous attitude toward politics because of the school book list. I read TKAM after high school. I’m glad I did because I would not have appreciated it like I do. It’s sad to say, but I will never choose to read another Steinbeck. Today, I find relief in reading the older books. They are so far removed from their contexts that they can be studied for pure method and content. Learning to love literature in its classic forms is a great way to study the writing craft without introducing the bias of the writer until later, so that, like a painting, the reader can appreciate its overall appearance before deIving into the artist’s motivations. This gives students the ability to understand how to wield the skills for their own unique messages. That’s my two cents. As far as the post goes, it doesn’t inform the readers of the goals of the classes for which Gove is prescribing these books; so I don’t know whether he’s chosen the books that will best support the lessons or not. Seems to me that both of these books were in the syllabus because they deal with themes of human nature, rather than being nation-specific. Both are tremendous stories with morality, courage and an exploration of roles which are suitable for any society, that help the mind consider situations and so are good for developing study skills, building empathy and considered attitudes to life. British ministers of the crown have no business at all fiddling with the minutiae of their portfolios and the present government has revealed why quite a number of times. Michael Gove should reflect that the mockingbird is outside his window, pecking on a Cornish pasty. Great post! While I can understand why British officials would want students to read British books, “To Kill a Mockingbird” is still one of the greatest books ever written and students ought to be encouraged to read it. I read it last year in my eleventh grade English course and I absolutely loved it! This is part of why I’m so strongly in favor of homeschooling: that way, you can read which ever books you want! It is interesting to know that both American books are well-loved in the UK. To Kill a Mockingbird is one of my all-time favorites. It seems to be that there would be room in the curriculum for both Dickens and Lee. Most schools here in the US have the students reading Of Mice and Men and To Kill a Mockingbird at about grade 8–although I’m pretty sure the books have been banned in some places. I think Great Expectations is usually read at about 10th grade. I am ashamed to say that I haven’t read To Kill A Mockingbird or Of Mice And Men. They were never on my curriculum. But The Scarlet Letter and The Pearl were and I loved them. We also never did any Dickens or Austen. And, although I mean to, I haven’t read any of those things on my own except for Jane Austen. She turned out to be one of my favorite authors so I really should put more effort into reading these other classics. But you should never take classics away from reading lists at school! If anything, you should add more. Ditch the textbooks and have kids read literature. Give them North and South and Gone With The Wind instead of history books. Make it interesting for them and they’ll want to learn. Don’t make it boring. I swear, adults forget what it was like to be a teenager or even a kid. What a fantastic post. I laughed out loud at your witty closing section. Oh my! I guess I’m mistaken, but I thought “Gove” was Serbo-Croation for “a great sucking sound.” Oh, well. I disagree with everything Michael Gove stands for, especially in terms of education. As a British book lover and former teacher I think that his attempt to reinforce an old-fashioned literary cannon is stifling to learning and imagination. But I also think that the arguments around To Kill A Mockingbird slightly miss the point. They mostly seem to be about defending its place in the scholastic cannon. Just like Gove, Lee’s defenders are saying ‘this book mattered to me, therefore everyone should read it’. I’m not saying that To Kill A Mockingbird shouldn’t be taught in schools, any more than Shakespeare should be cast out. But shouldn’t the curriculum be about developing skills and enthusiasm for literature, regardless of which books? Shouldn’t it be up to teachers to pick books that will be meaningful to their pupils and help to engage them in thinking about literature? Making the curriculum about key texts, rather than key skills, deprives teachers of that vital flexibility. Great post. I read about this in The Guardian, and although as a whole, it’s a disappointing decision, it’s promising that there seem to be at least two contemporary works being considered: one late-20th-century and one 21st-century. Which, of course, brings up another topic to tussle over: old classics vs. newer works that focus on contemporary social issues? I’ve no horse in this race (American living elsewhere in Europe), but I’ll definitely be watching. Thanks for the great commentary. My big point is, these books were not written to be studied in a classroom. They were written to read. To provide enjoyment and to provoke thought. We teach kids to read in school, which is great, so why can’t we just let them read. If they don’t want to, then they might it pick up later in their lives like me. Setting such a narrow range of books to study for GCSE or A level in my mind is ludicrous. What happens if you don’t like them – talk about putting you off literature. I read Wuthering Heights a few years ago as part of a writing course I was doing (I didn’t have to, it was optional) and I hated it. Just wasn’t interested in it in the slightest. Yet, on the same course, I also read Sons and Lovers by DH Lawrence, which I enjoyed. He wants to remove two of the most important works in American Literature…What is wrong with this man? Well said. As a product of the comprehensive school system in the 80’s where English literature wasn’t even taught I think it’s a travesty that this pillock can be allowed to meddle like this in our children’s education. I feel extremely bitter about the gaps in my own education because of idiots like this when I was growing up and it makes me furious to see it happening again. I can’t be doing with the arrogance of the man who is condemning a generation of children to such a narrow point of view as to just let them study English/British texts. Let’s face it, as wonderful as Dickens and Austen are, they have a narrow view of their own particular world – either middle class leisure or working class poverty. I for one applaud our American cousins for throwing some rich colour into our world that doesn’t rely on the stuffy class system of Olde Englande and actually explores more about human nature other than which sister of one country house is going to marry the gentleman from the next. Argh!!! These are two of the best books ever written – I think kids know how to identify the characters that have prejudices or are flawed. We don’t give young minds enough credit for being able to figure things out. I agree with Mr G that children don’t read enough, but I am not sure how an even more restrictive curriculum is going to address this. As a reader and a teacher, I love both books and my students’ reactions to them, and if I wasn’t so busy making my students jump through ever-changing hoops I am convinced I could get them to read – and enjoy – a much wider range of texts. Just give me the time and freedom. Some will have the room of reading delight though made into one forever closed to them. What an incredibly blinkered, dictatorial buffoon that man seems intent on being. It is interesting for me to see what people in other countries (I am in the US) think about their educational system and compare it to the issues in ours. The classics are taking a big hit here, too. It is a form of nationalism, it seems to me, to want to cut off access to all-things not your own. But that has no place in the arts. Literature, especially, was one important way I learned about world history and current events outside my small town in California. I hope a better resolution appears to Sec’y Gove. I signed the petition earlier on today. I love Mr Darcy, but To Kill a Mockingbird teaches us more of pride and prejudice than any Austen novel! I re-read Of Mice & Men recently and was blown away! I read The Red Pony and The Pearl in quick succession. Steinbeck’s brilliant in depicting country folk, semi-skilled and itinerant workers. I think these novellas stand the test of time! Seems to me this is something we should all think about, and this blog says what I feel so succinctly that it seems the best thing for me to do is re-blog it on my pages. Hope you find it as worthy a cause to shout about as I do. Re-blogged this on my pages. My introduction says: Seems to me this is something we should all think about, and this blog says what I feel so succinctly that it seems the best thing for me to do is re-blog it on my pages. Hope you find it as worthy a cause to shout about as I do. I love Dickens, but there’s no doubt in my mind that Lee’s is the greater book. It profoundly explores a serious issue and time period through the eyes of a child in a simple but memorable language. If you want overlong plots and fantastic characters, go with Dickens — but if you want an eye-opening experience — read Lee. Austen is wonderful for a light, fluffy read (let’s face it, much as we love P&P, there’s no real moral gravity to it — it’s a story about absurd behavior) but… shouldn’t our kids get a taste of what incredible literature CAN BE? This excellent article comes from the Interesting Literature blog. I felt it was well worth boosting the signal. I’ve interviewed many a lawyer who works in the social justice arena. Invariably, they tell me that Atticus Finch made them want to become a lawyer to give those who might not otherwise be heard a voice. Great post! I’m from the UK, and though I never got the change to study ‘To Kill a Mockingbird’ or ‘Of Mice Of Men’, (I’ve read the former for leisure) I think it’s a big mistake to try to get rid of them. There is a reason why kids have been studying them for all these years. Getting children/teenagers to study only English texts is a narrow-minded attitude, like only learning your own country’s history. No way near as useful nor fulfilling than studying a scope of cultures and themes and histories. Maybe it depends on the age a student is when they are asked to study these books. I took A level English and was happy with the language of the English classics but there are many children who are completely put off by Austen and Dickens. Everything went wrong with British education when we lumped all pupils into comprehensive schools and made them do the same exams – and, although I can see what Gove is trying to do, reducing coursework and depending on final exams will make things worse. I think giving children a text, like To Kill a Mockingbird, which also has a film, helps the less able to participate in learning and there are so many good films of Shakespeare’s works I would include those in any English syllabus. I have my suspicions about Mr Gove, that he doesn’t show any empathy with kids or education.